For every point the Lynx scored this season, home or away, Land O’Lakes donated ten pounds of food to Second Harvest Heartland. In addition to the 40,000 pounds of food donated for the Lynx and Land O’Lakes Points for Pounds program, Danielle Robinson and Lynx staff packed meal kits that will feed people in need. 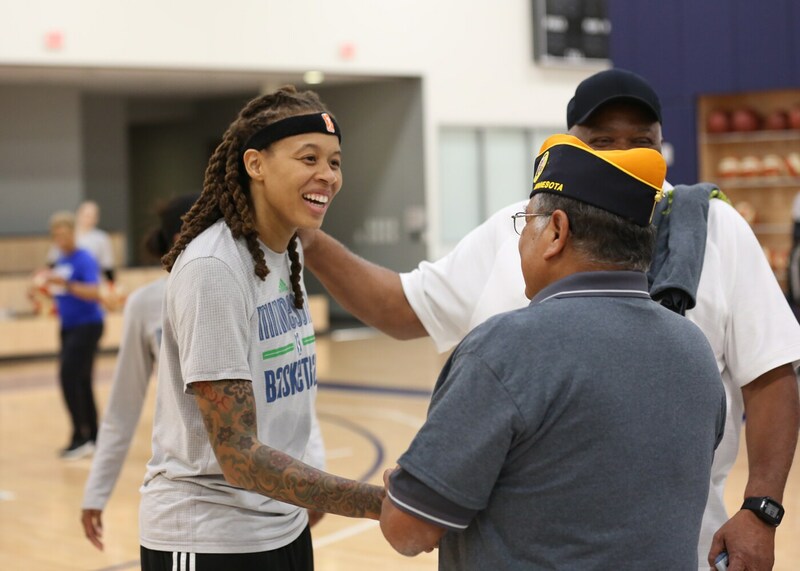 The Minnesota Lynx along with Disabled American Veterans of Minnesota showed their military appreciation by hosting 50 veterans and their families for an open practice. The 2nd annual Military Open Practice event began with a program in the Timberwolves and Lynx Mayo Clinic Square Theater, including breakfast, a photo station with the Lynx trophies and a raffle drawing for prizes. The group then received a rare opportunity to take a group photo with the entire Lynx team, a Q&A session with Coach Reeve and watch a portion of the team’s practice.